I moved back to Boston in spring 2017 to become the Sustainability and Environmental Resources Manager for Boston Public Schools, leaving a 7 year career experience at the University of California, Berkeley, where I had served as Coordinator of the Green Initiative Fund and founding Director of the Student Environmental Resource Center. Reconnecting with Boston College’s environmental and sustainability community has been one of the best parts of being back in my hometown because my BC student experience is the cornerstone of my sustainability career. I will forever be grateful to the co-curricular opportunities, academics, friendships, and mentors BC afforded me, and so giving back to current students and the college through events like Green Careers Night, Endeavor, and now BCCEAN, is very important to me. What makes it even better is BC’s growth in environmental interest and commitment since my graduation in 2008. 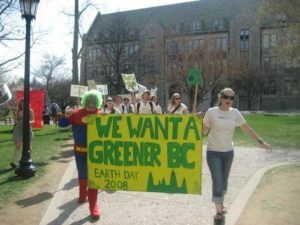 As a BC student, I served in leadership roles with Ecopledge, UGBC, and Appalachia Volunteers. I also participated in unforgettable service-learning trips with Pedro Arrupe and the UGBC Hurricane Katrina relief trip, and interned in Facilities Management for the BC Director of Sustainability. Ecopledge provided me with the invaluable experience of greening campus behavior and operations, from developing and installing the first residential hall recycling program, to retrofitting building lighting systems, to hosting environmental education events, to establishing the first campus organic garden, to creating the first BC Director of Sustainability position, making me realize I could have a career in sustainability education. Appalachia Volunteers, Pedro Arrupe, and my academics instilled the social justice lens through which I work and live. In my roles at UC Berkeley, I focused on leading collaborative environmental projects and climate actions, empowering students as social change agents, and growing a resource center dedicated to sustainability leadership, innovation, and education. I gained invaluable experience as an affiliated staff member of the Berkeley Food Institute, and member of the Berkeley Climate Coalition and UC Carbon Neutrality Initiative. Similarly to the Boston College campus, the UC Berkeley campus and UC system was our living learning laboratory, a place to create and implement sustainable change while involving all campus community members. I am now Boston Public Schools’ Sustainability and Environmental Resources Manager. The 125 BPS schools also represent living learning laboratories for climate action and healthy school environment initiatives. My role requires strategic planning, implementation, and communications for a variety of sustainability issues, like drinking water, zero waste, and climate and energy. 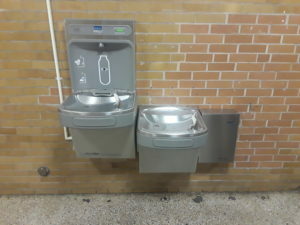 I also supervise the BPS Energy and Environmental Divisions, managing the utilities and environmental, health and safety issues for the schools. My favorite part of my job has been partnering with students, teachers, principals, and families to green their schools through initiatives like recycling and outdoor education. I’ve also loved connecting BPS to the City of Boston’s environmental leadership, involving students and operations staff in the City’s climate action plan update and zero waste planning processes, and training students as Greenovate Boston Youth Leaders. As I continue to learn how I can thoughtfully serve Boston College as an alumni volunteer, I am grateful to be involved with BCEEAN and reconnect with the Environmental Studies department. I hope I can lend my higher education sustainability experience to the campus, while supporting current students in their exploration of green careers and meeting fellow BCEEAN alumni. Katherine H. Walsh is the Sustainability and Environmental Resources Manager for Boston Public Schools. 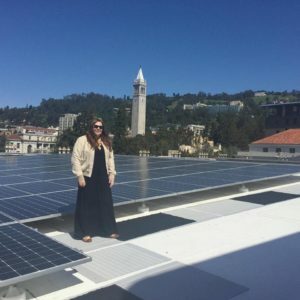 She previously worked at the University of California, Berkeley as Coordinator of The Green Initiative Fund and founding Director of the Student Environmental Resource Center. Katherine graduated BC in 2008 with a B.A. in political science and environmental studies, and has a Certificate in Leadership in Sustainability and Environmental Management from UC Berkeley-Extension.